21st Century Magic: A Conversation at the Harry Potter Exhibition, the British Library, London. 7pm. Find out how witches, druids and pagans practice today. Join witchcraft historian Vivianne Crowley, contemporary paganism expert Ronald Hutton, and author and Druidry historian Philip Carr-Gomm to find out. Chaired by writer and broadcaster Anita Sethi. Details. Talks and workshop at the OBOD Gulf Coast Gathering, Louisiana, USA. Details. SPRING RETREAT at the Hamblin Centre, West Sussex. The long British winter tends to diminish our reserves, but by April, longer and warmer days are starting to arrive. Here is your chance to take some time out to welcome the Spring and recharge your body and refresh your soul in the peaceful surroundings of the Hamblin Trust Retreat Centre in the heart of West Sussex. Details. Why seek out the ways of the Druids? It’s as if – even in the confusion of 21st century living – you can glimpse footpaths in the forest that seem magical, the sight of a deer standing in a shaft of moonlight, the call of an owl that tells you the Old Ways are still alive, that the wisdom of the Druids can still be accessed even today, and that to follow these clues does not require you to abandon your reason or return to some primitive way of being in the world. Joining Jack Gescheidt and Cara Gardner on their mystical tour through the English countryside: ‘Our group will dive deep into living history by spending time with sacred, historic and beloved trees hundreds of years old. And a famous yew forest with trees literally thousands of years old. In between, we’ll visit Neolithic monoliths from the dawn of European civilization.’ More details here. The One Tree Gathering is a project initiated by the ICCS (International Center for Cultural Studies) and OBOD (The Order of Bards Ovates & Druids) to explore values shared by Pagan and Dharmic cultures. The aim of the annual gatherings is to provide a platform for our communities to exchange ideas and form relationships based on friendship, mutual understanding and shared values. This year the One Tree Gathering is on 25th-26th of August at the beautiful Beaumanor Hall, near Loughborough. During the weekend we will have an opportunity to meet like minded people and take part in inspiring talks, discussions and interactive workshops. This year the Gathering will be based on the Tree and exploring your own ‘birth tree’ and what its values and qualities are. There will then be a tree walk to go and find your tree. Philip Carr-Gomm will lead us in experiences of Sophrology and a Druid Nidra, both of which combine Eastern & Western techniques and understanding. The price for the weekend is £50 and £60. Details and booking. 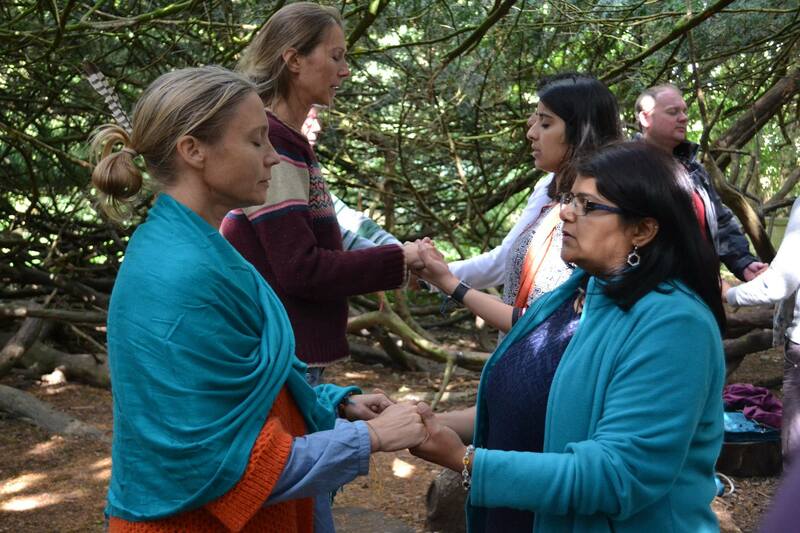 The Mystic Garden and the Sanctuary of the Heart – An Autumn Retreat with Philip Carr-Gomm at the Fintry Retreat House, home to the Fintry Trust, set in beautiful countryside in the Surrey Hills with woodland walks and extensive views across the landscape. The atmosphere of the house and grounds is perfectly suited to this contemplative retreat, with time for poetry and conversation about the spiritual life, and time for individual reflection, interspersed with healing and restorative meditations and exercises drawn from psychology and the wisdom traditions. Details. ‘Strange things happen when you follow a spiritual calling’… An informal talk for the Nova Stellar Meet-Up group in a pub in London. The group describes itself as: ‘A pagan social group meeting on the second Tuesday of the month with regular talks from members of the pagan community. A good opportunity to network, meet people and learn some stuff over a pint… We welcome those who have a genuine interest in paganism, especially newcomers who may wish to consider joining a formal group in the future. For example, you may have been working on a solitary basis and having trouble meeting established groups in the London area. Come and meet some people…..We are a friendly bunch! Their Facebook group is here.